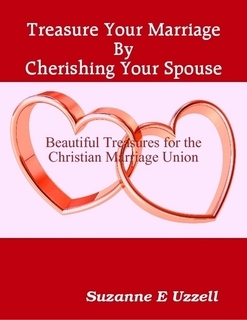 Treasure your Marriage by Cherishing your Spouse is an inspirational book for Christian Marriages written by Author Suzanne E. Uzzell. This book was written to ignite the reader to learn how to Treasure their marriage by cherishing their spouse. This book is a reuniting and rebuilding of the couple in the friendship, lover, and partner capacity within the marriage relationship. The reader will reflect on the care of the Godly union and their spouse. They will also learn the role they play within the marriage union is crucial and significant to the building of the relationship. This book will transform lives and cause the reader to revisit their wedding vows and learn the significance of their function in the Godly union. The reader will also have a new outlook on how cherishing their spouse will allow them to treasure their marriage union for a life time here on earth. Suzanne Uzzell was inspired by God to write Treasure Your Marriage by Cherishing Your Spouse to impact the Christian marriage relationship by reminding couples who read this book to value the beautiful gift God gave them. This gift is valuable and of great price. Your union God created is dear to his heart. After reading Treasure your Marriage by Cherishing your Spouse you will grow into deeper fellowship of appreciation and gratitude for your union and your spouse. You will also learn how to stand in love with your spouse and treasure your Marriage covenant by honoring your commitment. You will find hidden treasures with in your own marriage relationship as you transform self and learn to cherish the one God has gifted you with while living on earth.